Millionaire Shortbread recipe: the jury is out as to how these delectables got their name, but one thing is certain. They are luxuriously R-I-C-H. 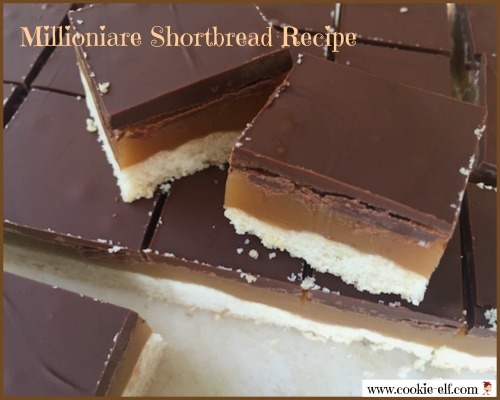 The bars have been traced to a Caramel Shortbread recipe in a 1970 issue of The Australian Women's Weekly, then dubbed “Millionaire’s Shortbread” in Scotland in 1990. The cookies double as a layer bar with a shortbread base (using the traditional ingredient ratio of one part sugar, two parts butter, and three parts white flour), followed by a soft caramel filling and a milk chocolate topping. Three different textures – crunchy base, smooth center, and crisp top – are not just unique. They’re awesome. The version here is easy and simple. And you can afford to make them, whether or not you're a millionaire. Preheat oven to 350°F. Line a 9-inch square baking pan with aluminum foil or parchment paper. Spray lightly with cooking spray. Set the pan aside. In a medium bowl, mix together butter, white sugar, and all-purpose flour until crumbly. Press the shortbread dough into the prepared pan. Bake for 20 minutes. Meanwhile, in a 2-quart saucepan, combine butter, brown sugar, corn syrup, and sweetened condensed milk. Bring the mixture to a boil. Continue to boil for 5 minutes. Remove the mixture from the heat and beat vigorously with a wooden spoon for about 3 minutes. Pour the mixture over baked crust while it is still warm. Allow the layers to cool until the shortbread begins to firm. Place chocolate chips in a microwave-safe bowl. Cook on high for 1 minute, stir, and continue to heat and stir at 2- second intervals until chocolate is melted and smooth. (Get more tips for melting chocolate chips here.) Pour the melted chocolate over the caramel layer and use an angled spatula to spread it evenly to cover completely. Cut the shortbread into small bars – 1-inch or so – because the cookies are so rich. Check labels. Be sure to use sweetened condensed milk, not evaporated milk, in the caramel filling. See more shortbread variations on our Shortbread Pinterest board.